But it’s been an odd year altogether even before this heatwave: a very dry winter, late frosts, a rainless April, early warmth in May and now a hot June. It’s played havoc with the garden and the poor plants hardly know whether they’re coming or going. Some things had fewer buds than usual because of the dryness in April so flowered really quite feebly - campanulas and hardy geraniums for example - others, like the roses, performed like divas, singing all the right notes in all the right order but, this season, rather too quickly and burning themselves out before their time. In general, the garden for our first opening on June 17th looked more like the garden should in early July. 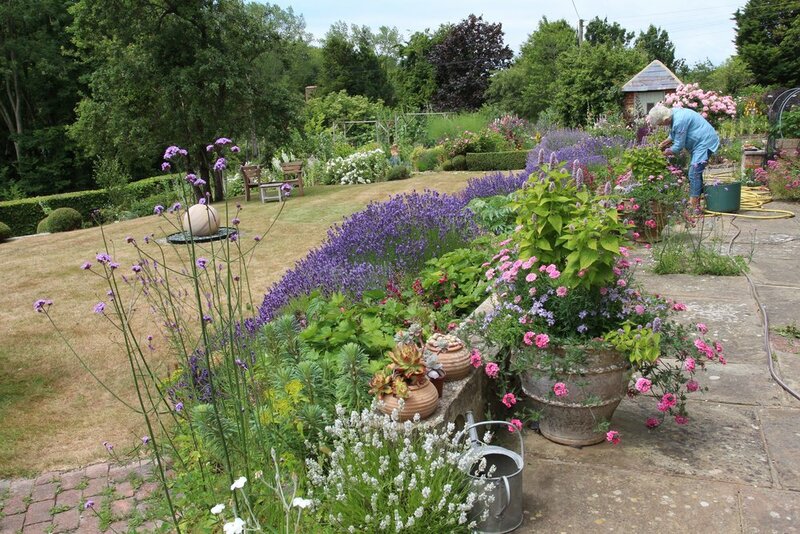 What it’ll look like for our NGS opening on the 6th, I dread to think. Because the real problem is now a lack of water: garden watering is done from the 3500 litre underground tank we had installed to collect rainwater from the roof and it’s now empty. Once before that happened and we topped it up with water from our well but this time that too has dried up. So until it rains again properly (and today’s drizzle is a complete waste of time) we have to resort to watering cans and water from the outside tap, which, for a thirsty garden, is both time-consuming and expensive and will be frowned upon when we get the inevitable hose-pipe ban. Two good things about this heat were that the summer solstice was, for once, idyllic and Sophie and 22 month old daughter Bay came to stay to get out of London’s furnace. Sophie, incidentally, is a top London DJ so if any of my three readers needs one for a function - corporate or private - contact her on bookings@sophielloyd.co.uk . So we’re deadheading like mad in the hope that a second flush will bring some colour and praying to any rain god that’s listening for some serious wet stuff to fall soon. Older PostThe miracle of May (not Theresa).